(Gloucester Township, NJ) – Since the October 17 launch of Project (Substance Abuse Visionary Effort) SAVE, an aggressive effort by the Freeholder Board to continue the fight against opioid use disorder, six additional municipalities have joined the effort to address the public health crisis. 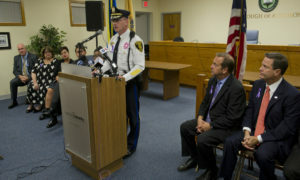 Audubon Park, Bellmawr, Brooklawn, Camden City, Haddon Heights and Haddon Township, along with the 18 original towns, will participate in the one year pilot program that will focus on early intervention by licensed social service professionals in the municipal court system to combat the scourge of prescription pill and heroin use that has ravaged our community. Defendants will be linked to the appropriate resources regardless of their ability to pay. Haddon Township Mayor Randy Teague said the initiative will provide direct assistance to those suffering under the scourge of opioid use disorder. Pine Hill, Pennsauken, Lawnside, Woodlynne, Gloucester City, Runnemede, Lindenwold and Collingwsood. Camden City Mayor Frank Moran talked about the opportunity for the city and the importance of the program.